250g of bread flour + more for dusting during shaping. In a large bowl, combined the water, milk & egg. Add in the refreshed starter and mix until it dissolved. Add in the salt and sugar. Add in the oil and mix well. Add in the flour and mix well like 1-2mins until the mixture is well incorporated. Note: The dough is soft & sticky. Cover the bowl with plastic cling and let the dough rest at room temperature for 2-3hrs until it rise doubled in size. Place the bowl into the fridge overnight or 7-10hrs. Flour the work surface and take out the overnight dough from the bowl. Sprinkle some flour on the dough’s surface. Punch out the air from the dough to deflate it. Flatten the dough and fold it into half, repeat this step for 3 times. Add more flour on the surface if you feel stick to handle it. Divide the dough into 10 portion. Coat your hand lightly with some flour. 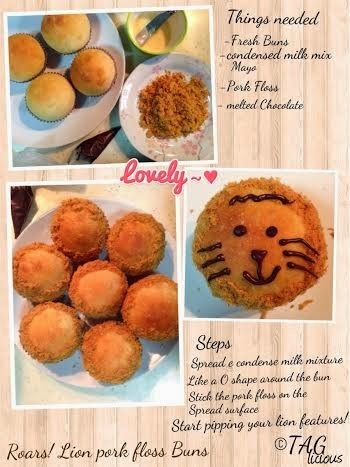 Make each small portion of dough into round shape and place it into a lined muffin cup on the muffin tray. Cover the muffin tray with cling wrap and let the dough rest for 2-3hrs until it doubled its size. Preheated the over at 200C and bake them for 20mins or until the buns’ surface is golden brown. Let it cool on a wire rack. 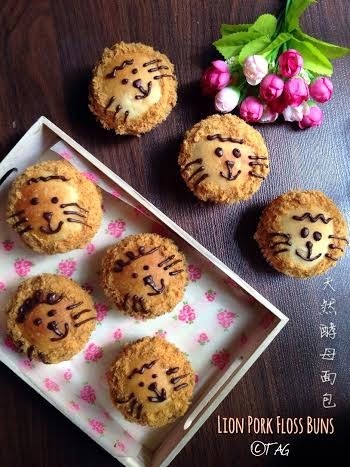 Once it is cool, we can start making our lions bun. ROAR! Spread the condense milk & mayo jam like a O shape around the bun. Stick the pork floss on the spread surface. Use the melted chocolate, start drawing out the lion’s face feature.